“The triggered emails account for approximately 6% of all direct revenue from the email channel and most of this revenue is incremental." Developed a series of triggered emails that are live all year round. To capitalize on seasonal periods they've also introduced Countdown Timers, which add a sense of urgency to their email communications; especially important in the lead up to Valentine’s Day, Easter and Christmas to ensure customers know the cut-off dates for deliveries. A personalized email is automatically sent to a customer 30 minutes after a cart has been abandoned, reminding them of the products that remain in their basket and inviting them to "check out". With the Cart Abandonment program working well the team has taken the opportunity to further strengthen customer engagement with the use of Animated Countdown Timers, as well as plans afoot to introduce browse abandonment. Has been working with Fresh Relevance since 2013, when they introduced a hugely successful cart and browse abandonment programme that achieved a 957% return on investment. They're now taking full advantage of Fresh Relevance’s innovative range of new dynamic, real-time SmartBlocks to improve visitor engagement and drive online sales; including the use of Countdown Timers and Social Proof. Customers receive an email 30 minutes after they have abandoned their shopping basket and again after 24 hours if they have not returned to complete their order. The team is now looking to take their customer email communications to the next level, through the introduction of Countdown Timers. Weird Fish was introduced to triggered messaging experts, Fresh Relevance, and its cart abandonment solution via the website of its email service provider – dotMailer. To assess the performance of its new cart abandon strategy, the team conducted an A/B test, whereby 50% of customers who abandoned their carts received a triggered email and 50% were not sent a message. “Working collaboratively with Fresh Relevance we conducted a test which recorded an impressive 60% improvement in click-to-open rate, but more it also resulted in a 43% conversion rate uplift!" Now sends approximately 2,000 abandonment emails per month (a customer receives an initial email after 30 minutes for an abandoned cart and an hour after a browse session), achieving an impressive 50% - 60% open rate. They expect to raise this rate even more and are continually testing to improve their open and conversion rates. Saw an opportunity to make major improvements to how they approached cross-channel customer engagement, both via email and online. Sent 9,495 cart abandonment emails which resulted in 2,279 return visits and 107 orders. 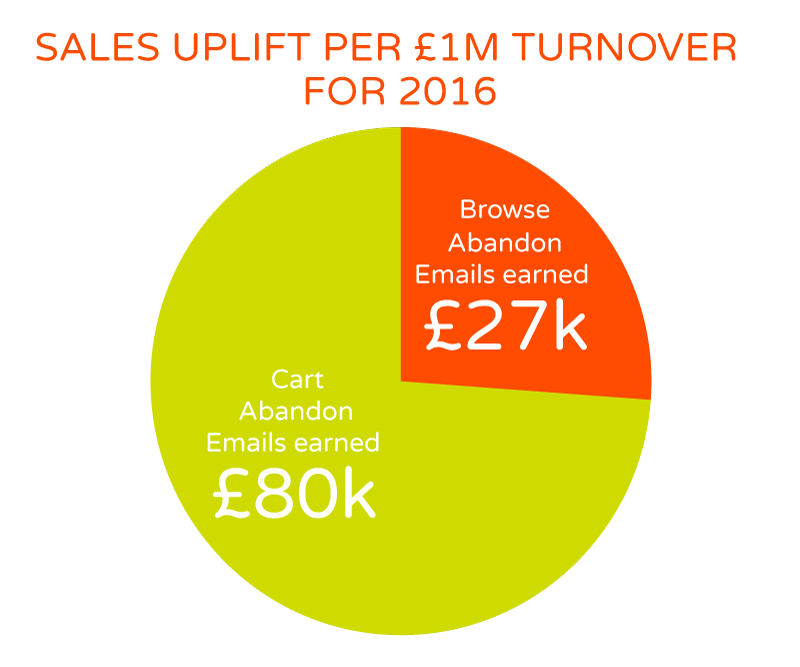 An additional 34,421 browse abandonment emails were sent which resulted in 2,785 visits and 27 orders. Recommendations in marketing emails resulted in 37,422 opens and 295 orders. “At least 4% of our weekly sales revenues can be directly attributed to our abandonment activity, which in 2016 represents an average sales uplift of 7.2%,"
Customers receive an email 30 minutes after they have abandoned their shopping basket and again after 24 hours, if they have not returned to complete their order. The team is now looking to take their customer email communications to the next level, through the introduction of Countdown Timers.